This entry was posted in EN and tagged news on November 17, 2015 by FEMEN. This entry was posted in EN and tagged news on November 16, 2015 by FEMEN. This entry was posted in EN and tagged news on November 15, 2015 by FEMEN. This entry was posted in EN and tagged news on November 13, 2015 by FEMEN. This entry was posted in EN and tagged news on November 12, 2015 by FEMEN. This entry was posted in EN and tagged news on November 7, 2015 by FEMEN. 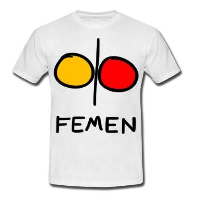 This entry was posted in EN and tagged news on October 23, 2015 by FEMEN.